Last week I put together a few busy bag activities for my kids for our six hour flight. We LOVE name activities & crafts, so I knew this would be a hit with my kids. 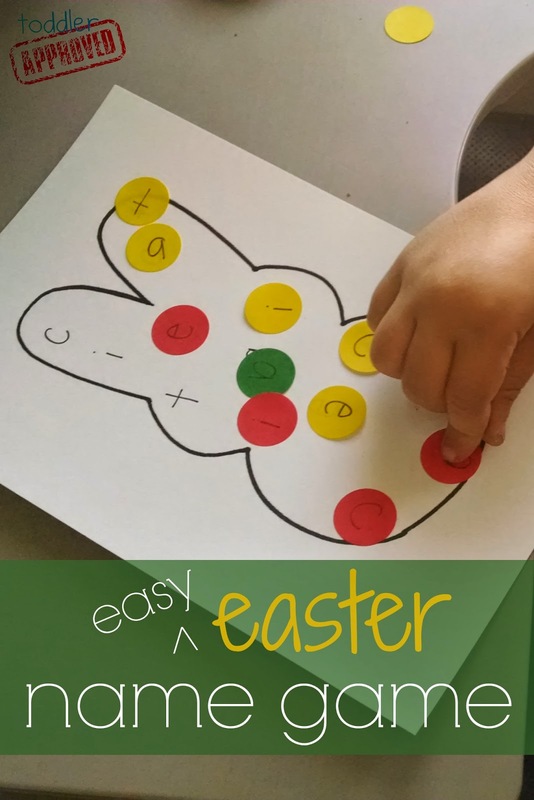 This easy Easter name game was super simple to put together and a great way to review the letters in my preschooler's name. You could really use this idea to review anything- ABCs, numbers, shapes, etc. 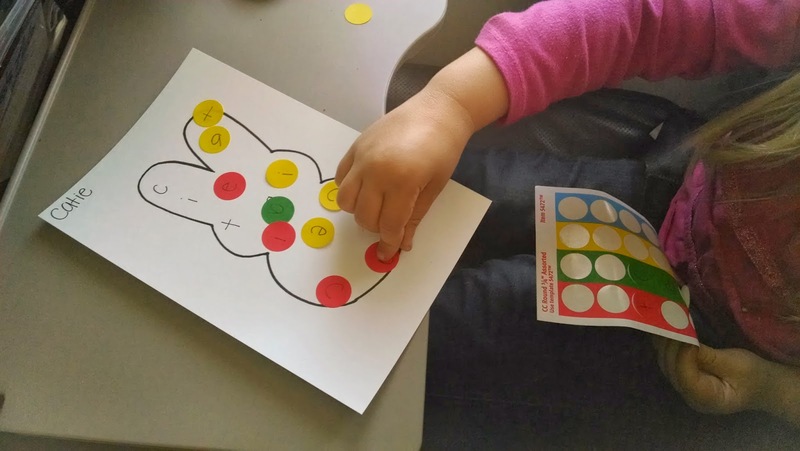 This activity was inspired by No Time for Flashcard's Santa Themed Math Game. To prep-ahead I just printed off the template, cut off the text from the template, and then wrote the letters in my daughter's name all over the bunny's body. I made sure to leave enough space between the letters so that the stickers wouldn't overlap. Next I wrote the letters in my child's name on the colored dot stickers (one letter per dot). 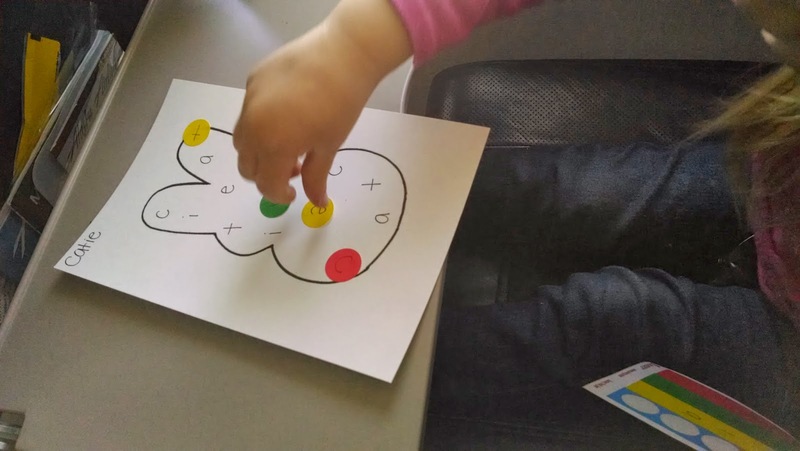 Give your child the bunny paper and invite them to match the dot sticker letters to the letters on the bunny's body. My three-year-old got started right away with matching the letters and exclaiming, "I found a C" or "Look I matched the letter e."
Once she was done all of the letters were covered with stickers. She was so proud! The stickers then easily peeled off and we could play again. I didn't worry about the letter stickers getting placed on the bunny in the right direction because I was focused more on exploring the alphabet letters in my daughter's name and matching the letters with the stickers. When teaching kids the alphabet and letter recognition I always like to start with the letters in their names first since kids LOVE their names! This easy Easter name game is so quick to put together and simple to take along in your purse. 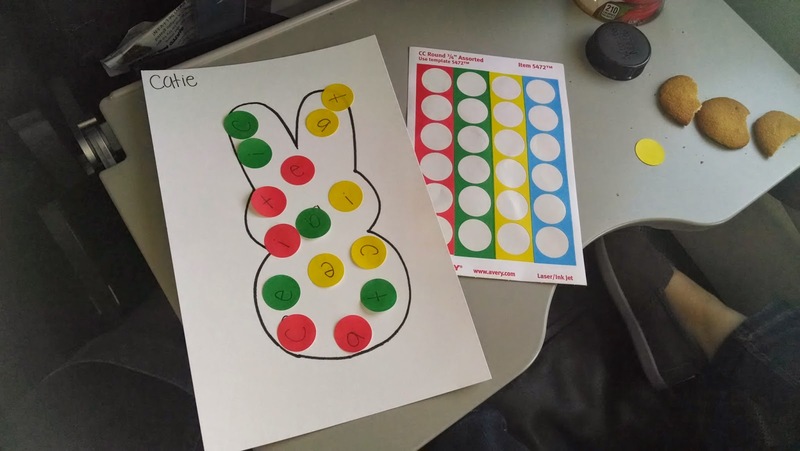 For my 6-year-old I modified this activity and put sight words on the bunny and I also put math facts on the bunny. For the math facts I wrote the answers on the bunny and wrote the math number sentences on the stickers. He had to solve the math problem on each sticker and then cover the answer that matched! He wanted to play again and again! Here's a Paper Plate Name Game I shared over at NurtureStore. Playdough Name Cap Cars are fun for car lovers. Name Monster Puppets are fun for pretend play and letter recognition. I also have a Name Activities & Crafts Pinterest Board that rocks. PS- We have an amazingly awesome giveaway on the blog right now. Don't forget to enter our little BLAST science kit giveaway! I love that you made these for an airplane ride. Such a great idea! And, the math adaptation for your six year old is genius. I can't wait to use this for my kids - thank you!